raumlaborberlin has created a lot of fascinating answers for playing with the urban space. Their project “The Big Crunch” is one good example of it. The usage of trashed furniture, refrigerators, wooden items, scrap, timber, windows etc. give the project an additional statement. The created swarm offers a place for discussing, gathering and sharing the time with other people. 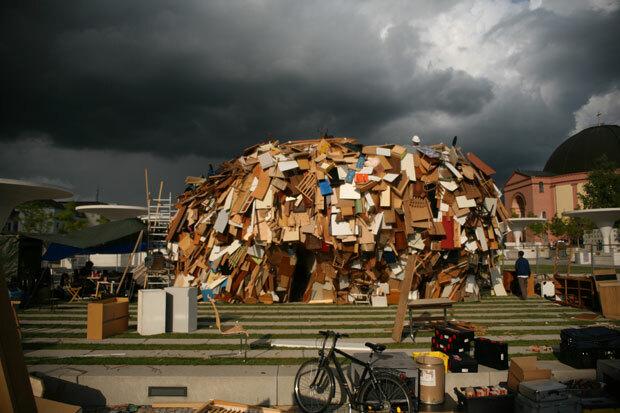 The artistic intervention took place in 2011 during the Architectural summer “stadtfinden” on the Georg-Büchner-Platz in Darmstadt. Further information is provided on the website of raumlaborberlin.